The Circus Thief is a delightfully nostalgic tale of compassion, kindness, and generosity. 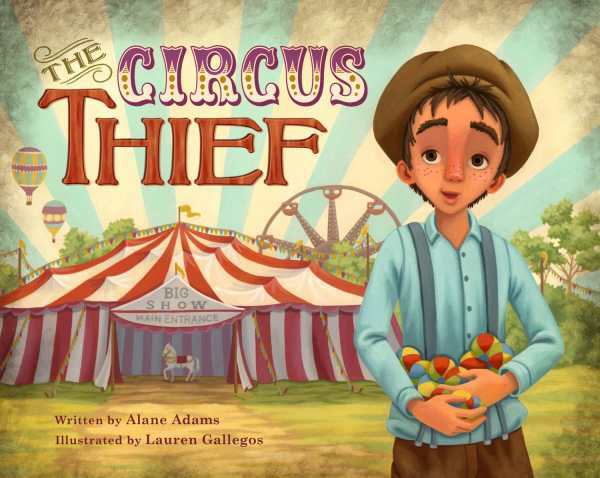 Excited to see the wonders of the traveling circus, one little boy soon learns that not everything under the big top is fun and games in Alane Adams’s The Circus Thief, book four in a touching picture book series set in 1920s Pennsylvania. Georgie is beyond thrilled when Papa agrees to take him to see the elephants at the circus, but when the ringmaster introduces a beautiful show horse, Roxie, he quickly loses his heart to the clever mare. Devastated to learn that Roxie has been sold to a cruel work farm, Georgie is determined to save her, whatever the cost. The story is set in the small town of Girard, Pennsylvania, in the summer of 1929. Georgie’s family is a captivating representation of post–World War I America. On the cusp of the Great Depression, Papa is taciturn and hardworking, but his actions reveal a soft heart. Mama cooks and cleans in the kitchen, and Georgie is busy with his own chores, gathering eggs and feeding animals. The family’s personalities and attitudes emphasize respect, family values, hard work, and counting pennies. Whimsically detailed illustrations from Lauren Gallegos add to the vintage ambiance with everything from costumes—Papa in coveralls and flat cap with a perpetual five o’clock shadow and Georgie in suspenders, knickers, and long stockings with lace-up boots—to antique oval portraits in sepia on the walls and jugs of milk on the table. Roxie, or Lady Roxie, “the most Royal of Arabian Steeds,” is resplendent in purple silk tassels with a brilliantly curled white mane. She seems like a mismatch for Georgie’s sensible family, and it is amusing to imagine Mama’s reaction and Papa’s attempts to acclimate her to their modest homestead. Georgie is drawn to her, though, and they bond instantly when he is allowed inside the ring for a ride. Papa is uncharacteristically flush with cash and spends it liberally while attempting to rescue Roxie, at odds with his practical, working-class persona and humble demeanor. There is a subtle lesson for children about earning money versus completing chores as a family obligation: “Now why would I give you a dollar for something you ought to do?” However, the idea gets a bit lost when Papa contradicts himself by agreeing to take Georgie to the circus since he finished his chores. Created for primary- and elementary-school-aged children, each book in this historical fiction series works as a standalone, although fans of Girard, Pennsylvania, will be pleased to recognize familiar characters like Georgie, who seems to find excitement wherever he goes. The circus is bursting with amazing sights and sounds, from clowns and elephants to a lady with a beard, in The Circus Thief, a delightfully nostalgic tale of compassion, kindness, and generosity.